Make your retirement go farther with these low cost state and expat options. Inflation in healthcare costs has jumped in 2015 with the April Medical Care Index reported by the Bureau of Labor Statistics increasing 0.7% in just one month, the fastest pace since 2007. Combine the pace of surging costs with the fact that Americans age 55 and older have an average 401k balance of just $150,000 as of March 2013. As a result, it’s never been more important to consider ways to make your retirement go farther. One of the biggest decisions you’ll make in retirement is where to live. It will determine your overall cost of living as well as the taxes you’ll pay. Consider these low-cost states and expat options before you make the move. ObamaCare added a 3.8% net investment tax to a growing list of ways the government is sapping your retirement funds. Between higher federal taxes, taxes and the high cost of living in some states, you’ll need to look elsewhere to make your retirement go farther. The map below, from the Tax Foundation, shows the combined state and federal top marginal tax rate on dividend income across the United States. The rates take into account the deductibility of state and local tax rates at the federal level for a combined rate. 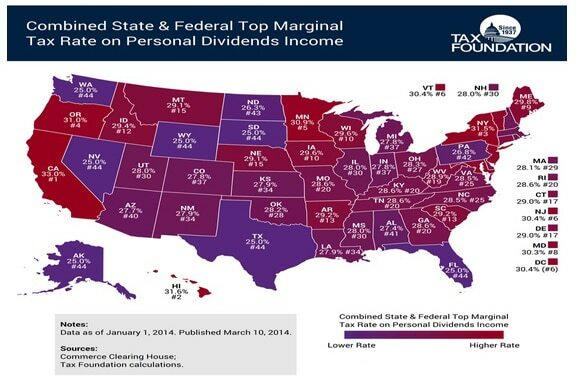 It’s no coincidence that the states with the highest tax on dividend income also have the highest income tax rates. Tax-hungry states like California top the list with its 13.3% rate on personal income, followed by Hawaii, New York and Oregon. There are seven states that offer some of the lowest combined tax rates in the country and don’t tax dividends. Low tax states like Alaska, Florida, Nevada, South Dakota and Texas might all be good options to make your retirement go farther. Beyond the lower income tax rates, you’ll want to consider sales tax to determine where you want to call home. Five states impose no sales tax including Oregon, Montana, New Hampshire, Delaware and Alaska. Note you may still have to pay a city or county-based sales tax. Since most retirees spend a large portion of their income, sales taxes can take a big bite out of your retirement. While it’s always nice to save on taxes, you’ll also need to consider the relative cost of living in each state. A low tax rate may not matter if you can’t afford to pay for food and heat every month. 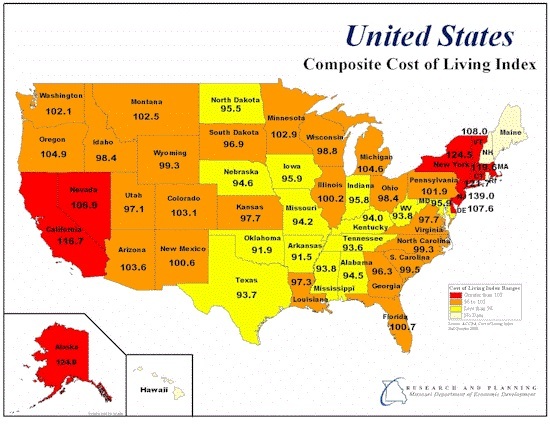 The map below, built on Census data and courtesy of the Missouri Department of Economic Development, shows the relative cost of living in each state. Popular retirement destinations like Florida and Arizona may be getting too expensive for retirees, with cost of living at or slightly above the average. Fourteen states in the Midwest and Southeast could help make your retirement go farther with a discount of up to 8% in the national average cost of living. Moving overseas is growing in popularity for many retirees. In fact, the cost of living and tax burden is so low in some expat destinations that Americans are finding they can retire earlier than expected. Besides a lower cost of living, you may not have to pay U.S. federal income taxes if you remain outside the country for more than 330 days out of any 365-day period. 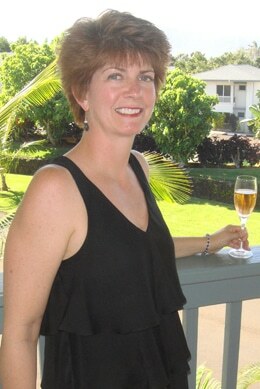 The Foreign Earned Income Exclusion may allow you to make your retirement go further than you even dreamed possible. 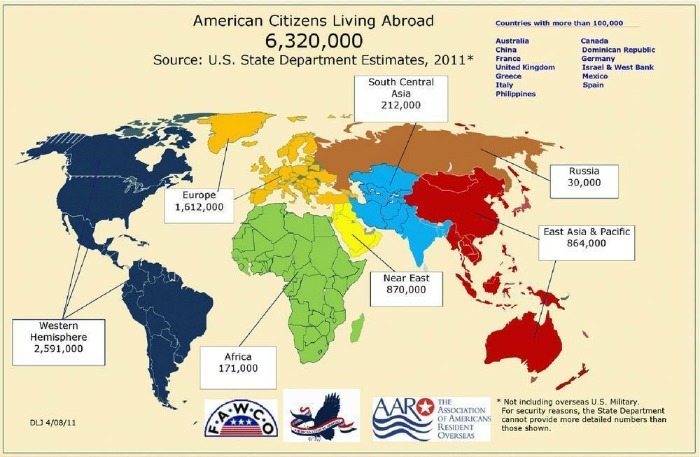 Asia and Latin America continue to be the top choice for most expats, with nearly 900,000 Americans living in East Asia and millions in Central and South America. Ecuador ranked as the lowest cost expat destination in Internations’ 2014 survey. Nearly all expat participants (88%) rated the cost of living positively and the Expatistan calculator puts the cost of living in Cuenca at 36% cheaper compared to Phoenix, Arizona. If you prefer tranquil beaches and a relatively stable climate, Thailand is one of the most popular expat destinations in Asia. The Expatistan calculator puts the cost of living in Bangkok at 33% cheaper compared to Phoenix, Arizona. There’s a lot that goes into deciding where to live in retirement, though cost of living and taxes are two of the most important considerations. Consider the entire range of factors including weather, language and culture before you make your decision. Get the facts and you may realize that you can retire now and make your retirement go further than you hoped.